Rudraksha Yoga | The Highest Knowledge – that reality knowing which everything else becomes known! Happy Navarathri and Vijayadashami festivals! Spiritual symbolism and significance of mala beads(Japa Mala) in meditation. You may want to read and enjoy! Meaning: Let us keep on praying that Primordial Power(Aadi Shakti) Shridevi eternally(for Her kind Grace)! Rudraksha Yoga wishes everybody around the world very happy Navarathri and Vijayadashami festivals! 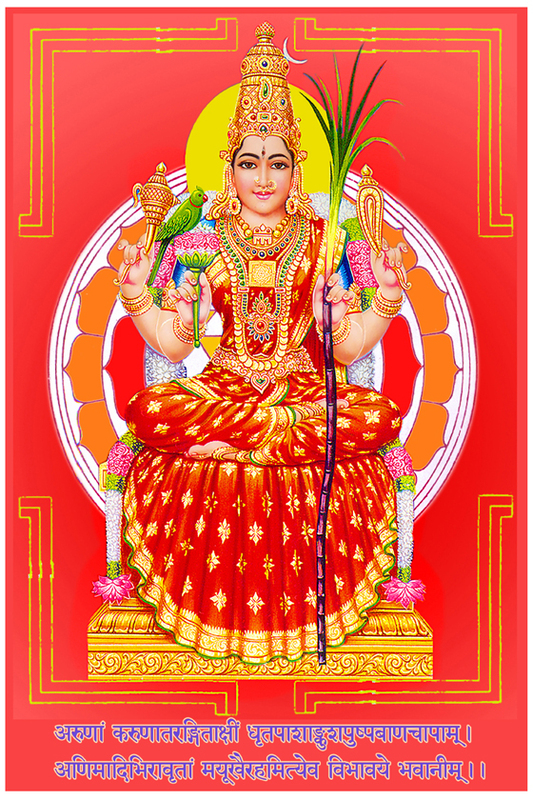 Navarathri(a.k.a Dasara) starts on the first day of bright lunar fortnight of Ashvina month on the Hindu calendar. This year, it starts from today, i.e. 25th September 2014. Vijayadashami is celebrated on the 10th day after nine days of Navarathri, i.e. on 3rd October 2014. 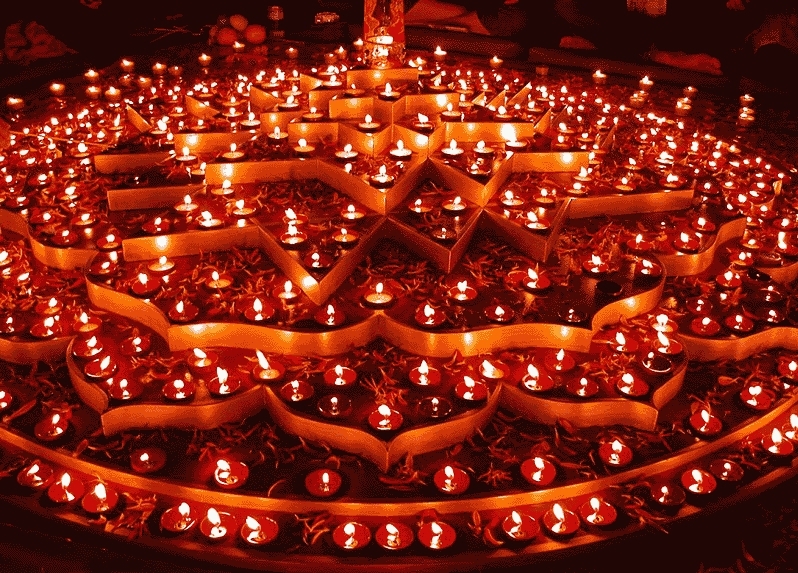 The word Nava-rathri means nine-nights. Traditionally, on each night of Navarathri, a specific form of Great Goddess Shridevi Durga is worshiped. According to the Scripture Markandeya Purana, the nine forms are Shailaputri, Brahmcharini, Chandraghanta, Kushmanda, Skandamata, Katyayani, Kalaratri, Mahagauri and Siddhidatri, in that order. When the entire world was terrorized by a notorious daemon called Mahishasura(Buffalo-headed daemon), the Gods prayed the Greatest Goddess Shridevi for help. Their devoted prayers were finally answered. Suddenly, a brilliant flame appeared. The Supreme Mother Durga emerged from that flame. The Gods became very happy. They donated their weapons to her: Indra gave his Vajrayudha(thunderbolt), Lord Vishnu gave Sudarshana Chakra(wheel), Lord Shiva gave his Trishula(Trident) and so on. After nine days of fierce battle, the Goddess Durga killed Mahishasura finally. Entire world was jubilant and happy! This day on which Shridevi slayed the daemon Mahishasura is celebrated even in this era as Vijayadashami(Literally,10th Day of victory). This auspicious day comes after Navarathri festival. On this very auspicious occasion of Navarathri, let us all pray the Divine Mother and the Greatest Goddess Shridevi Durga with full devotion and complete surrender for her compassionate and kind Grace on us. Meaning: Salutations to Shridevi Durga, who is present as power in all beings. Salutations to Her, Salutations to Her and Salutations to Her(…again and again, always and forever!…)..
May the Goddess Shridevi Durga bestow health, longevity, wealth, prosperity, the Highest Knowledge and the liberation to every one of us! Rudraksha Yoga wishes our esteemed readers, followers and well-wishers around the globe a very happy Shri Gowri and Lord Ganesha Festivals celebrated in India on 28th and 29th August 2014. You may want to take a look at our devotional conVerses to understand more and pray these supreme powers. 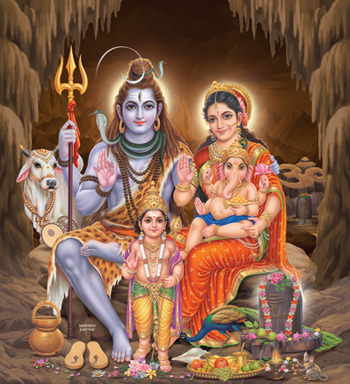 May Shridevi Gowri, Lord Ganesha and Lord Shiva bless everybody in the world! 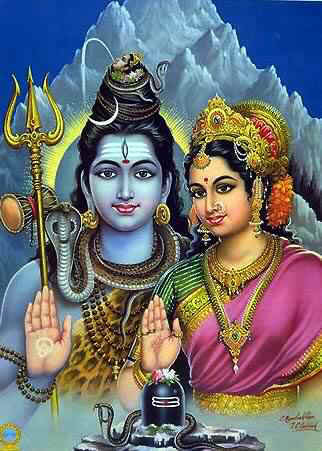 Lord Shiva and Shridevi Parvati : The Great Dual Powers of the Non-dual Reality! Let us continue to explore more esoteric secrets of nature of the Ultimate Reality from the great teachings of Yama(the Lord of Death) to Nachiketa. Meaning: Sitting he wanders afar; lying down he goes everywhere. Who, other than myself is fit to know that God who rejoices and rejoices not? Notes: In the earlier verse, Lord Yama(Lord of Death) said that the Ultimate Reality is subtler than the subtlest, greater than the greatest etc. He elaborates on the nature further. This mantra says that the Ultimate Reality(a.k.a God) is omnipotent and omnipresent. He can do things simultaneously. Lord Yama illustrates these points by apparently contradicting actions. God can wander everywhere by sitting in a place. By sleeping, he goes everywhere. These statements mean that the God is omnipotent and omnipresent. Moreover, the God is always blissful because of his own nature. So, he does not have to rejoice to make himself happy separately! These attributes of the Ultimate Reality unleashed by the Great Master Lord Yama cannot be understood by teaching/coaching by somebody else. They must be experienced by ourselves by connecting our own Individual Self to the Universal Self via Traditional Indian Yoga. The word Madanyo means other than myself. This word has been strategically used to mean that the Ultimate Reality is nothing other than our own Individual Self. According to our Upanishads, our Individual Self is same as the Universal Self. This is the core of non-dualistic (Advaitha) teaching of our Greatest Realized Master Shri Shankara Bhagavatpadah. The supreme goal in our lives is to escape the the birth and death cycle and to attain the Ultimate Reality Om, so that we will not born again to suffer due to accumulated karmas. Caution: Interpretation and views expressed above are ours own, from our limited understanding of the verse. Authentic traditional meaning of the Upanishads can be grasped by reading authoritative commentary Shaankarabhshya by our Great Realized Master Shri Shankara Bhagavatpadah. So, reader’s discretion is advised.